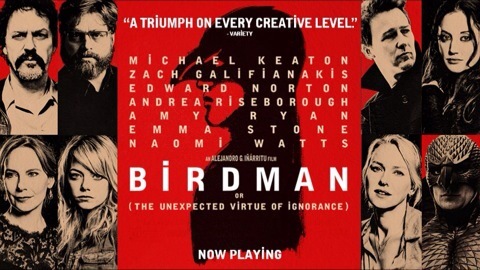 Birdman is definitely a film lover’s film. I’ll probably not mention it to any co-workers today if they ask what I did over the weekend because I know I’d just be met with blank stares. I’m not saying that as some film snob because I’m not – I like some things that are slightly more obscure but I also like plenty of mainstream movies. 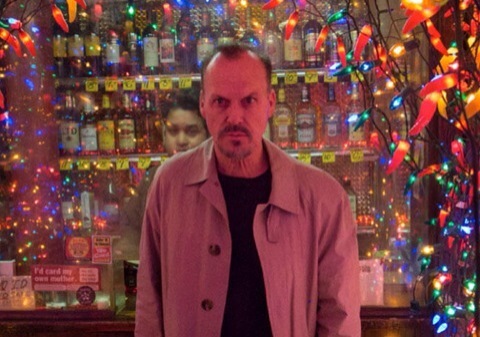 Unfortunately, I didn’t enjoy Birdman as much I was hoping I would as a film lover. First of all, I’ll say that the performances are as good as I’d heard. I’m very happy that Michael Keaton is nominated for an Oscar as I’ve always quite liked him and I think he’s done an excellent job in this so it’s nice seeing him finally getting some recognition (and he’s my favorite Batman). 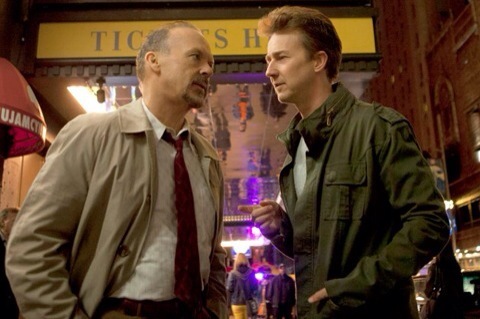 Emma Stone is also very good as his messed up daughter and Edward Norton as a real prick of an actor. I can’t fault any of the acting or the script or… anything, really. It just didn’t really work for me overall and I walked away from the movie knowing it was one I “appreciated” as opposed actually “enjoyed”. Which is fine sometimes but it’s great when you can have both. As far as this year’s movies filled with Oscar nominated performances, I think I actually preferred Foxcatcher as a film. Even more than a film lover’s movie, this is an ACTOR’S movie. I can see why actors or anyone with theater experience would love it. It’s not something I can relate to at all but I’ll be very surprised if Keaton doesn’t win the Oscar as he’ll certainly get all the actors’ votes. I really liked the “play within a play” concept and the use of music worked so perfectly with that. I also liked the various storylines for each character and there were some good humorous moments. 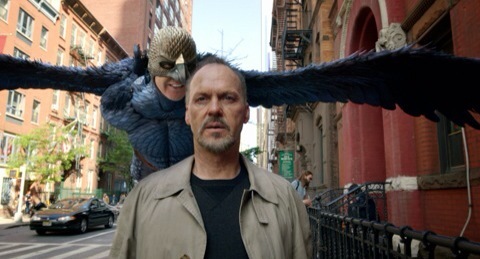 To read a great review from someone who more fully appreciates what this movie is trying to do, I’d suggest you read Cara’s Birdman review over HERE at Silver Screen Serenade. She uses big words like meta! Well, okay – that’s actually a pretty short word… I’m not going to ramble on about this movie or do a summary. This is a good movie with an original concept and great performances (including a career high from Keaton). I very much appreciate what they’ve tried to do and like that it felt fresh & original. But, in the end, I just didn’t really care about the characters (except maybe Keaton’s a little) or what the outcome would be. Still, I fully support movies like this as opposed to the countless remakes, reboots & sequels out there. I just wanted to like it more. Yeah… I REALLY wanted to enjoy this one more. My expectations were too high! You phrase ““appreciated” as opposed actually “enjoyed”” sums it up perfectly for me, but as I go see movies to enjoy myself and be swept away I rated it lower. It simply didn’t move me and the continuous shot gimmick I found distracting. Nightcrawler was like that for me… appreciated me than enjoyed. But I am really looking forward to this one. We’ll see how it goes. Great review! Thanks, Zoe! 🙂 Yeah, Nightcrawler was that way for me too. Actually, I’d say I liked Nightcrawler quite a bit more than this although I prefer Keaton’s performance to Gyllenhaal’s. I finally saw a film before you haha. I did like it more than you, but well written and fair piece. I still can’t get over how amazing Norton is. Thanks! No way – you saw a film before me?! 😉 I really wanted to love it… Norton was good, though. And Keaton & Stone. All were great! Sounds like something that would make me want to do harm to myself. The ensemble is terrific here and absolutely sells us on the characters they’re playing. Good review. Thanks! I agree that the performances are excellent. Just wish I had liked the actual movie more. Aww thank you for linking to me, Mutant! You’re too sweet. 🙂 Sorry to hear you didn’t like this one as well as I did! I see what you mean–TOTALLY an actor’s movie. Which, yeah, is probably why Keaton’s gonna win it. I’m okay with that though! Great review, lady!! Lol. I don’t know about this “much better” nonsense, but you’re very kind. 🙂 Go, Keaton, go!! !